This was true indeed because the rock in question was a flat shield-shaped chondrite with a weight of 600 grams at least. A beautiful meteorite with a sand polished fusion crust in which single chondrules stood out. The sight of the meteorite displayed on the bright surface like in a cabinet of natural history triggered a state of euphoria. Millennia ago this place had witnessed debris from a far away world falling from the sky. Rocks from a body which had already orbited our central star eons before the first life started to emerge on young earth. This chunk of rock was a storytelling ancestor of our own world, marked with the scars of a fiery descent through the gas atmosphere of our planet. And although meteorites are being found every day, and the purpose of our journey was exactly this, an unbelieving amazement surprised me that such find could purposefully succeed during a human lifespan. The other circumstances of the discovery were remarkable as well. If one stood directly in front of it, the stone appeared to rest on the bright limestone gravel as if presented on a silver platter. The harsh visual contrast could almost be perceived haptically. By stepping back a few yards and looking around though, the eye caught hundreds of dark rocks. From a distance they all showed little or no difference in shape and color which would distinguish them from our find. These were all lydite nodules weathered from the limestone substrata, shattered and distributed by the forces of nature. Why we had of all things stopped at this particular rock could not be explained by visual characteristics alone. Until midday we combed the surrounding hills and Queds for further fragments. At this site, there was also plenty of evidence that the place had been searched extensively over decades by the local nomads. In addition, the already well-known deep black plains composed completely of lydite gravel were all around us. In these fields a meteorite find from the car, according to the aspects of visual search we were familiar with, was highly unlikely to say the least. With the intention to lift our skills in this regard to another dimension, Pjotr and I began to search these surfaces with particular thoroughness. Due to the technical implausibility of its success such an undertaking was rather suited as a meditation exercise for Zen Monks. For advanced Zen Monks, as Pjotr added. On the black fields after a while a form of vision occurred, in which the eye did no longer try to focus on a single stone. Instead the view panned without focus and intention over the surface, while the senses behind, like a fine-tuned instrument, sought to detect slightest deviations in the stream of visual data. This was an occupation from which one awoke after hours without remembering a thought like from a profound dream. Slowly we advanced in the direction of Zulu-Plateau. After a final ascent along a meandering ridge a vast plain marked by hundreds of tire tracks stretched before us. Evidently the well navigable plateau served as a transit strip on the route into the Qued Saquia in the north. On its northern finger we later found a crooked hut which told of temporary settlement by nomads – most probably during limited periods after the winter rains. On the bright gravel pavement several species of Agamas and the whip tailed gecko Stenodactylus petrii roamed about. Between the few shrubs the cream-colored Cursorius cursor preyed on darkling beetles. The beautiful bird was easy to recognize by its peculiar curved stripes, one black and the other white, that extend from the eye to the neck. We had perhaps spent an hour slowly traversing the plain towards the east when suddenly in a split second a dark brown spot passed by close to the vehicle. I wasn’t able to tell what exactly was about the stone that had caught my eye, but I nevertheless stopped the car and got out. It took me a while until I found the stone again. It was the remarkable surface texture that had triggered my attention. A delicate pattern of finest unevenness, which did not occur in similar shape on the surface gravel. This pattern was so unique because it was created during the ablation process on the broken surface of a meteorite fragmented still in hot flight. I had just found the second meteorite of the day. The specimen of perhaps fifty grams could justifiably be described as fresh. A broken surface facing downwards, which, after fragmenting, had only suffered moderate ablation, showed traces of heating which were still clearly distinguishable. The fact that only minimal stains of rust flawed the patina free surface suggested a relatively brief terrestrial age. The bright sand-colored chondrule-free matrix pointed to an equilibrated chondrite, a type 5 or 6 probably. Pjotr joined me and congratulated with a broad smile. Zulu-plateau had turned out an excellent destination. I could nothing but agree. We welcomed the unexpected break and took various shots of the meteorite in situ. I completed my notes and added the new coordinates and a description of the find site. Then I carefully picked the rock from the desert pavement. It showed a flawless broken surface and geometrical, only slightly ablated edges. It was a good day. The clouds had meanwhile disappeared and we took our brief lunch in the shadow of the car. In the distance our Swiss friends worked the open plain on foot, despite the punishing heat which had already built up. “Isn’t it strange, they’re crawling on all fours. What do you make of that Pjotr?” After an intense view through the binoculars Pjotr shrugged. “Perhaps they lost the car key” he suggested. After we sat and watched for another while I started the engine to go and see. Already a hundred yards away from their car Roger stopped us with the gesture of a traffic warden and called “Halt! You are not commissioned to enter this zone. This is a meteorite strewnfield!” After the previous experience of the day, this seemed like a plausible explanation to us and we got out. The specimen was indeed uncommon and did not look much like one expected a desert meteorite to look. It completely lacked the brown or reddish color and also the semi-glossy patina which is usually found on weathered chondrites in arid find environments. Instead the nut-sized specimen showed a matte bluish hue, like we knew it from the grey lydite which were a great source of frustration for we picked them up permanently. Since Roger’s remarkable find the two had painstakingly scanned the closer surroundings on foot. Their efforts were rewarded half an hour after the first find, when Marc discovered a second piece about fifty yards away. There was little doubt, that it was another mass of the same material. 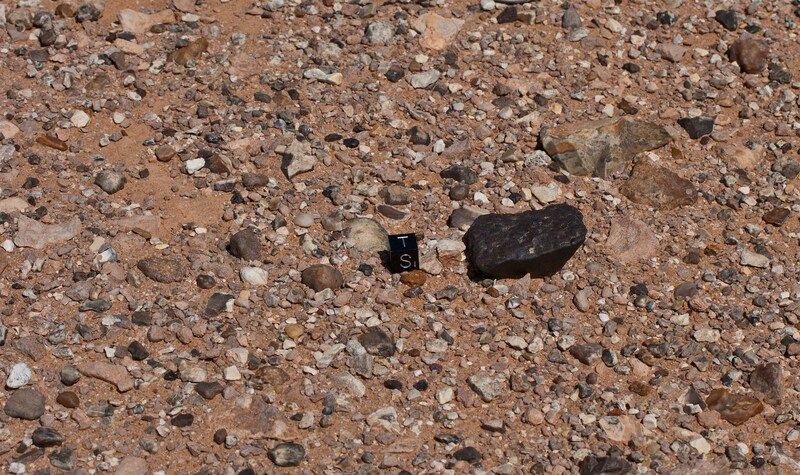 Marc had left the specimen where it was found for us to study the rare carbonaceous chondrite in situ. The scarred surface surprised us with a lamellar micro-texture. In places it showed distinct characteristics of corrasion due to saltating sand grains. The surface erosion on this specimen appeared to progress rather in a selective than a laminar way. Also there was no portion of rust distinguishable in the weak patina. This meteorite’s appearance differed considerably from its fellows and we took the opportunity to memorize its features diligently. In the meantime, the heat on the shadeless plain had become punishing. Pjotr and I went back for our car. In a wide arc we circled the Swiss team’s find location and continued our search on the far side. Before we departed we had exchanged a set of coordinates at which we would meet in the evening. The flat plateau seemed to enclose no challenging terrain whatsoever, and so we thought of a separate search as justifiable. After only a kilometer or two our cruise was halted by the drop off of the plateau. From its edge we looked down into a chaotic Qued intersected by numerous smaller ravines and gullies. On the satellite chart we could see that the ascent on the far side of the valley lead to another finger of Zulu plateau, which was separated by a V-shaped valley section at this place. To save precious search time, and in order to prevent circumnavigating the valley and having to face the stark sunlight directly, we decided to traverse the valley instead and win the plateau again on the far side. The crossing of the silted-up trough-shaped gullies which ran across the valley proved unexpectedly difficult. Often only a vehicle-length of space was available to accelerate the jeep sufficiently to climb the opposite embankments. Such a trough, its bottom and opposite slope filled with powdery sand, finally sealed our fate. Due to a lack of momentum my ambitioned attempt to climb the opposite bank got stuck in the blocks. And our effort to reverse and win the rearward bank also failed. Now Pjotr, with reference to having sunk several 4wds on various occasions in the sands of the Rub al Khali, took charge of the steering wheel. I wondered whether this expertise qualified him for the task, but having just bogged down the car I was obviously in a weak position to argument. Despite my concerns Pjotr indeed managed to get the car moving again by ploughing backwards alongside the bank. In doing so, however, the car inclined to a scary angle and threatened to capsize any moment. Now few options remained. The only wheel which still had traction had dug in to the axle in the fathomless silt while the chassis in half length sat on the sand, and the other wheels turned freely with no contact to the ground. We had us beached and that by every trick in the book. After a drink of water we assembled the jack in order to prop the dug in wheel and to line it from underneath. In this situation there was nothing funny about the fact that the jack which the rental company had equipped our car with had a leak, and all the hydraulic fluid had long since drained from it. The device could now only be used as ballast. Our situation was quite ironic because the trough on the bank in which we just bogged down was not even ten yards wide. An arm’s length away from the skyward pointing wheels was firm ground. The orientation of the gradient however, worked against us. Without a winch or tackle the only option we had was upwards and slantwise up the slope. Our brief Qued-crossing threatened to escalate into hard work. At 104°F in the non existent shade these prospects were not at all too tempting. Wistfully I remembered my folding shovel which I had the smart sense to pack in my suitcase prior to our departure. Unfortunately my suitcase had been missing on our arrival in Agadir. Although it was handed over to me by a friendly manager of Royal Air Maroc a day later, at this time it was already relieved of most technical equipment, all batteries, and even a pair of trousers. On this occasion someone also must have found pleasure in the idea of owning a folding shovel, the one I sadly missed now. For want of a better digging tool I had to take our frying pan and use or abuse, if you like, it as a digging tool. Like all our kitchen gear which we had acquired in Agadir, the device in broad letters sported the witty brand “Titanic Productions”. The name said it all, and so I was only little surprised when the handle broke off instantly at the first try. Silent and concentrated we toiled and sweated as time went by. By excavating and supporting the wheels from beneath while inching back and forth, we managed to get the vehicle back into a horizontal position. This alone took us three hours. Then we started to dig two trenches, each half a meter deep and filled these with rocks which we hauled from the nearby bank. After this we made inch-wise headway on our makeshift road. 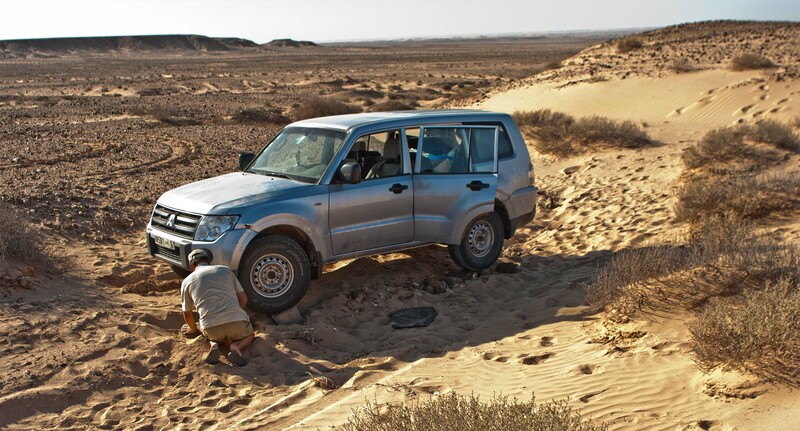 Unfortunately in doing so, the vehicle repeatedly slipped from the narrow stone packing towards the bottom of the trough where it instantly dug itself into the powdery sand. As a result of that, our complete road building had to be shifted repeatedly half a meter. After another three hours we finally reached firm ground. Completely exhausted and crusted with a layer of powdery dust which only spared the eyes, we departed towards the ten kilometer distant rendezvous point. Already from afar we could make out the headlights of the Swiss who had parked their vehicle on a hilltop to serve as a beacon for us. We were three hours late. With serious concern they had waited for us. The relief was accordingly when finally our lights emerged at the distant horizon. “Another half an hour and we would have gone for El Aaiún to request the UN-helicopter for a search” Marc explained. “We had the situation under control at any time” I smiled at him and Pjotr nodded. Dusted as we were from head to toe, it was little wonder that Marc did not look too convinced. The hillock meanwhile was swept by a strong and north east wind and it had gotten unpleasantly chilly. Pjotr and I felt not in the mood to perform more heroic work that evening. We wanted to set up our tents at the next best spot and enjoy a good night’s rest. The Swiss instead had discovered an unmarked dirt track leading to the south and suggested to spend the night in a real bed, namely in a hotel in El Aaiún. The prospect of a shower convinced us in the end. The unmarked track turned out surprisingly navigable and after an hour we had reached the Amwizirat. After another hour we were on the already familiar tarmac road connecting Smara with El Aaiún. Late in the night we checked into a hotel in the city center of El Aaiún. Subsequent to an opulent breakfast we hit the road once more. This time in the direction of the Haggounia oasis. In this direction we had two more targets north of the Saquia valley left on the schedule which we intended to investigate during the trip. Barely five kilometers behind the city borders suddenly the warning light for the engine temperature flashed. Much to our dismay the water in the radiator was boiling. We discovered a small leak which we provisionally repaired. For only little water was missing, the leak could not have caused the temperature rise alone. Optimistically we refilled the cooling water tank, but after just several hundred yards the indicator was in the red again. With this vehicle a desert drive had become unthinkable. Our telephone call to the rental company helped little. A voice machine in Arabic told us that they currently had their “usual break”. In the late afternoon we managed to get through to a manager, but the only statement we could get of him, was that by no means we were authorized to have the car repaired ourselves and that by no means they would cover any towing expenses let alone our accommodation in a hotel. It was not until we had brought into play the right contacts that the rental office agreed to send us a mechanic from Agadir. Since we had already collected some experience in the field we towed the vehicle without further ado into town ourselves. The rest of the day we spent with sightseeing around the souks of El Aaiún. Pjotr had the foresight to purchase a new jack. This time, after we had learned the hard way, we tested it right on the spot. The following morning at precisely eight o clock in the morning we met the mechanic on the hotel’s parking lot. Already as the expert failed to open the hood, doubts were raised concerning the gentleman’s qualification. When he pointed to the half empty wish wash-tank and suggested that this was the reason of our problem, it was clear that his expertise wasn’t clouded by any automotive knowledge whatsoever. The man took the car keys and drove the vehicle to a nearby workshop for the real experts to have a go on it. A plan which we already had suggested the previous day, but which was denied to us by referring to the small print in our rental contract. It took the folks in the repair shop less than two hours and our radiator was humming smoothly again. A stone in the propeller had jammed a blade. With a delay of one and a half day we set off again. At exactly the right time as we soon found out. While searching in a maze of narrow streets for the single bridge across the Saquia, we lost our way and were suddenly caught in a crowd surging from a nearby mosque, chanting excitedly and waving their banners to us. In the side streets detachments of army and secret police were gathering. Although this appeared to be a pro-Moroccan demonstration, as a foreign tourist one was well advised to keep a low profile and not to raise any attention from the forces of law. Least of all, if one carried extensive photography equipment like we did, which could easily bring us under suspicion to have a different agenda then meteorites. All our encounters with Moroccan police and security forces had been positive so far. Without exception we had been treated polite and friendly on the various checkpoints and we were keen to keep it that way. Finally we found the right turnoff to Dchira and further to Al Haggounia. Around noon we left the dirt track to Haggounia and turned north into the vast rocky plains of the Agti Lathia. The top strata here were bare dolomite bedrock showing old inactive wind erosion patterns, now lacquered with a silk mat patina. By the remarkable degree of erosion one could tell that much stronger winds had prevailed during the time this landscape had formed. Small debris was virtually absent or showed heavy corrasion. Despite the very shallow root-zone the terrain was covered by waist-high specimens of the camel thorn Zilla spinosa. The passages between the plants were difficult to navigate. We worried less about the car paint but rather about our tires. With reason, as we found out later when we filled the meanwhile fourth punctured tire with the last liter of the Swiss patent cure. The further we advanced towards the east, the higher the Barchans grew. These were long arc shaped dunes of early Holocene age arranged in linear belts. These belts had a north-south orientation and were expanding over several kilometers in length. At first they were easy to traverse by navigating through the wide gaps between the single dunes. Further east the belts closed and since we approached from the downwind side, the dunes could only be overcome by ascending the outermost ends of the slip face which was a tricky business. I was convinced that meteorites could be found on the vast spaces between the barchans despite the chaotic terrain. However, the abundant vegetation limited ones field of view and the amount of surface which could be covered in the course of a day was comparatively small. Undaunted we hoped for a chance find. At the evening we camped at the foot of a sickle dune. This caused the winter sports tested Swiss to verify various utensils in terms of their suitability for downhill skiing, with little success, but to the great amusement of the audience. On our way we had passed a number of pre-Islamic burial mounds along a chain of Alamats which had once marked the ancient caravan route to the Haggounia well. At the foot of one of these path markers we had come across the remains of a small caravansary. Pot sherds and broken water jugs were scattered about, and two grave mounds reminded on the hardship and imponderability a desert journey at the time of the Phoenicians implied. As we sat at the crackling fire after the day’s work an artifact between the firewood caught my attention. Amazed I pulled the object from the pile. A gently curved T-piece seamlessly assembled and pegged with a wooden dowel. The work piece was made of an exceptionally weighty and tough sort of wood which I had never encountered before in the Sahara. It was heavily abraded by sand. “And where does that come from?” I asked around. “Oh this. It stuck from one of the stone piles down at the last Alamat we passed. I thought it would make a good piece of firewood” Roger told me unconcerned. It was a rare wooden artifact from one of the grave mounds. Rare for the reason, that the modern nomads, like Roger, were constantly on the lookout for firewood as well. This piece however, no one had dared to take. For a start I confiscated the piece and took down its find circumstances. Its aesthetics and style of manufacture indicated a special object and perhaps its original purpose could be established. In any case it was a remnant from a time only preserved in myths and historic travelogs, and as such to me it seemed worth preserving in its own. During the following day a meteorite find was denied to us. Because we were running out of time and our trip approached its end, we changed course around noon and headed for the coastal road leading to the north. Because we had depleted our supply on red wine in the meantime, and because we planned on celebrating Marc’s birthday that night, urgent action was required. By identifying and making accessible the only wine selling establishment within 200 kilometer radius, the Swiss again gave impressive proof of their talent to tap new sources of alcohol in the strictly Islamic Kingdom of Morocco. In this case it was a Korean restaurant near a desolate crossroads thirty kilometers south of Tan Tan. The place had actually been closed, but somehow the Swiss had convinced the friendly lady of the urgency of the situation. At the mouth of a dramatic canyon, ten kilometers south of the estuary of the Wadi Draa, we pitched our last night camp. Fog obscured the desolate beach that roared from the pounding surf. Our bath in the waves of the 55°F cold Atlantic made us quickly forget the punishing heat of the past weeks. The birthday was appropriately celebrated with an exuberant dinner and a remarkable bonfire fed from a huge pile of driftwood collected on the shore. The event was a worthy finale of our journey. Presents were exchanged and speeches were offered, in Russian, English and Swiss German. From Marc I received an original Douk-Douk, and so I had not only a lasting memory of our journey, but also the memorable picture of Roger Dances with Tent engraved in blue steel in my pocket. 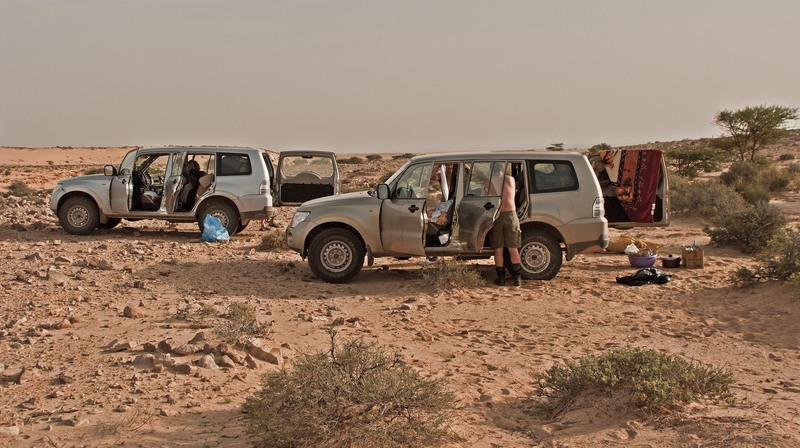 On our trip we had covered 3,600 kilometers, two thirds of in the Western Sahara. For the area of the Qued Saquia al Hamra and its tributary Queds, for which hitherto only two meteorite finds were documented, we added a further six sets of coordinates, a quadrupling of the known finds. 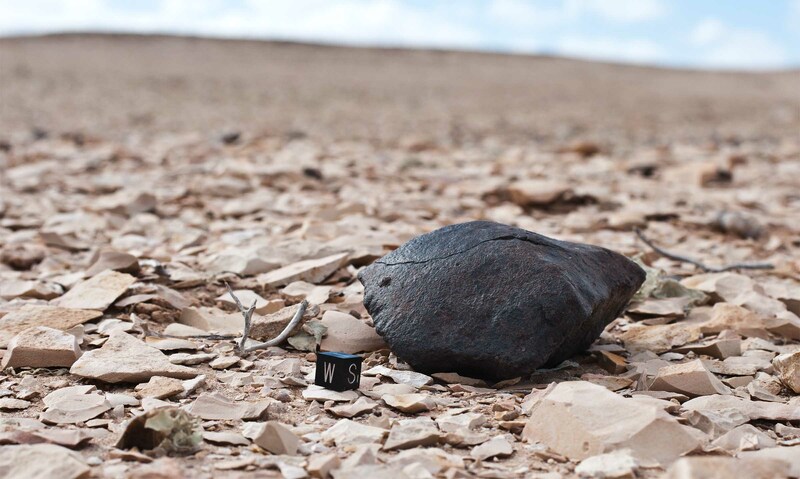 The discovered meteorites are now scheduled for analysis and classification. We will report the final results here. The Ergs of the Saquia and the Tifiquirn’s black Hamadas will accompany us for years to come. As a landscape of primeval starkness, only patchily covered by a thin blanket of civilization, the labyrinthine Queds of the G’idat Amwizirat have gouged themselves deep in our memory. The proximity to the settlements and cities along the coast is deceptive. Similar to the great continental deserts the traveler is well advised to remember, that for every triumph and discovery the desert grants, it demands tribute elsewhere.